Do you remember? Or maybe you have never seen the movie Pay It Forward? Anyway it’s one of te most simple but best concept ever. March 2011 | While it’s important to be aware of mega-trends like CITYSUMERS (see last month’s Trend Briefing), in business, execution beats everything. This is why an easy-to-apply consumer trend such as RANDOM ACTS OF KINDNESS (R.A.K.) should be firmly on your radar in the coming months. HUMAN TOUCH | Consumers increasingly wanting to see the human side of brands (or if indeed a brand has a human side at all ;-), making R.A.K. more welcome than ever. PUTTING IT OUT THERE | Audiences publicly disclosing more and more personal information on Facebook, Twitter and other social networks, about their lives, moods and whereabouts, both current and intended, enabling R.A.K. to be more relevant. PASS IT ON | More consumers than ever are now sharing their experiences with their friends and wider audiences on social networks, meaning R.A.K. can spread far beyond the original recipients. The link with R.A.K.? Members of GENERATION G are also left cold by old-school business priorities and formalities. With sharing, creating, discussing and collaborating for many becoming a way of life (both on and offline), people want and expect interactions to be genuine and enjoyable. And yes, that includes interactions with brands. Meaning R.A.K. reach out to those consumers craving ‘human’ brands who show not generosity, but acts of compassion, humanity, or even just some personality. All this personal information increasingly enables brands to actually know what’s happening in consumers’ lives (both good and bad!). In fact, it’s never been easier for brands to listen and react to potential customers’ needs or desires in innovative or even personalized ways. As much of this happens in real-time, brands can increasingly engage with consumers right at their moment of need, making R.A.K. more relevant, and therefore better received. Changing notions of social status, where status (especially online) can be increasingly derived from publicly displaying and sharing knowledge, skills, influence and popularity rather than pure wealth and power (STATUSPHERE). Consumers disclosing their intentions or whereabouts, either to each other or to companies in return for better offers and/ or service (CROWD CLOUT and PRICING PANDEMONIUM). Using crowd-sourcing techniques to create or improve products and services. And of course, public disclosure has its dangers: from the practical (remember Please Rob Me, a site that (temporarily and glibly) drew attention to the risks of over-sharing on Twitter and Foursquare? ), to businesses and governments (literally) abusing the endless flows of individual data now being disclosed. Indeed, how consumers, brands and governments wrestle with new privacy norms is one of online world’s key issues. But that’s for a future briefing. Now, let’s not forget that brands have always been able to offer R.A.K., whether informally or, for large brands, via heavily publicized ad campaigns. But a R.A.K. strategy can now be cost-efficiently applied by all brands, because the ‘PUTTING IT OUT THERE’ effect also guarantees that many R.A.K. recipients will share their experiences with an ever-wider audience. The explosion in both the volume and reach of connections creates huge opportunities for brands that create interesting, meaningful, funny, uplifting moments that people love to share. Which means that R.A.K. can now touch thousands, if not tens of thousands of people, rather than just the original recipient. Be genuine. R.A.K. should demonstrate a brand’s attitude, not be a (temporarily) welcome exception to it. Any cold-hearted, stuck-in-the-past brand who thinks it can fake it will be unmasked in today’s transparent marketplace. And the backlash won’t be random. Be personal, but not too personal. Audiences will like R.A.K. that are aimed at their individual circumstances or needs, but equally don’t want to feel like a brand has been stalking them. However, brands should make sure they ensure that their R.A.K. is appropriate. A light-hearted gesture at the right time will be appreciated, intruding into personal issues certainly won’t be. Be compassionate, not crass. R.A.K. from ‘human’ brands are welcomed because they are just that, acts of kindness, rather than purely self-serving corporate marketing stunts. Make it shareable. Give someone a reason to share their R.A.K. with their friends and family (even better if they have something to share, whether it be an extra ticket, or an online video). Be generous. Yes, GENERATION G appreciate any brand generosity, but better to be really generous to a few people, rather than kind-of-nice to lots of people. Have meaning and purpose. Encourage consumers to engage in their own R.A.K. And then (publicly) reward them for it – leaving them with a great STATUS STORY. Get real. Want to really surprise people? Then deliver a R.A.K. right to them, in their daily lives, surrounded by family, friends, or colleagues. While people will share R.A.K. online, offline acts will always have a big impact, too. Don’t intrude, or be pushy, or sell. This isn’t about you or your brand, it’s about the recipient. The UK based division of BioTherm, the skincare brand owned by L’Oreal, have been reaching out to tired Twitter users and offering them free product samples of their Skin.Ergetic anti-fatigue range from their @BioThermBeauty account. In October 2010, flower delivery service Interflora launched a social media campaign in the UK designed to brighten up the lives of Twitter users by sending them flowers. Interflora monitored Twitter looking for users that needed cheering up. Once found, the users were contacted and sent a bouquet of flowers as a surprise. In November 2010, Dutch airline KLM ran an experimental campaign called How Happiness Spreads, where it employed a “Surprise Team” to give passengers tailored, unexpected gifts at the airport. Combining with location-based game Foursquare, as soon as someone checked-in at a KLM Foursquare location within its network of airports the Surprise Team went online to find more background information about the person, decided upon a suitable gift and gave it them before they flew. For instance, one traveler tweeted he would miss a PSV Eindhoven football game while he was in New York. The Surprise Team, accordingly, gave him a Lonely Planet guidebook of NYC with all the football bars highlighted in blue. In June 2010, US cracker brand Wheat Thins (owned by Kraft Foods/Nabisco) launched their ‘The Crunch is Calling” campaign, featuring a Wheat Thins van tracking down and surprising tweeters who had indicated their attachment to the crackers. Each selected tweeter was filmed being unwittingly greeted by a whole pallet of the product. The videos were a success, with the campaign’s YouTube channel receiving nearly 1,500,000 views. In December 2010, Spain based airline Spanair collaborated with creative agency Shackleton Group to surprise passengers on one of its late Christmas Eve flights. As the passengers waited to pick up their luggage at the carousel, the airline sent out personalized presents to everyone who was onboard as a way of celebrating the holiday. In December 2010, Finnish travel company Tjäreborg, a subsidiary of the Thomas Cook Group, picked a family at random and flew them from the freezing Finnish winter to the beaches of Phuket, Thailand with three-hours notice. Videos of the family’s vacation were shown on TV and online around Christmas. Washington based eco-conscious restaurant chain Sweetgreen employs a street team to perform ‘Random Acts of Sweetness’ for its customers. Previous acts include covering people’s bike seats when it rains, or leaving gift certificates for drivers who’ve received parking tickets. In December 2010, Diageo owned Ciroc Vodka launched a campaign in New York in association with rapper Sean Combs and NYC DOT. The Safe Rides Program saw Ciroc staff teams distribute pre-paid gift cards to consumers that could be redeemed for taxi rides until the end of the month – working like mobile credit, the cards could be used in taxis until the USD 25 credit had run out. Launched in Canada in March 2011 under the tagline “an act of kindness, big or small, can bring a little joy to someone’s day”, the Random Acts of Chocolate campaign from US confectionary behemoth Mars aims to grow a community of kindness ambassadors in the country. The campaign challenges Canadians to commit to 50,000 acts of kindness, with each act measured by a Kindness Meter that will serve as the kindness pulse of the nation. Participants are encouraged to share their stories of kindness with others and nominate local community organizations for a chance to win one of three CAD 10,000 donations. As part of their Brighter Mornings campaign, the Canadian division of orange juice brand Tropicana, brought a 36-foot wide helium balloon ‘sun’ to Inuvik, an Arctic Town 200km north of the Arctic Circle whose 3,500 residents face 31 days of darkness in winter. In February 2011, Dutch beer brand Heineken produced a film entitled ‘One Million Hugs’ to celebrate reaching one million ‘likes’ on Facebook. The film featured a group of Dutch female models visiting bars in Amsterdam and hugging male lager drinkers. The clip ended with the line “Thanks a million”. Botany Town Centre, a New Zealand based shopping mall, launched Freebruary in February 2011. Shoppers who were ‘snapped’ by photographers as they were purchasing something, could keep the product for free. And of course, there’s Oprah. As someone who pioneered R.A.K., Oprah understands better than most the power of this trend. Despite previously announcing the end of her Big Give show, in September 2010, on the first day of the final season of the Oprah Winfrey Show, the host announced that she would take the 300 members of her studio audience on a trip to Australia in December 2010. Then again, in November 2010, the show’s audience was given keys to the 2012 Volkswagen Beetle. In February 2011, Spanish travel agency Atrapalo helped Lucas Jatobá, a Brazilian creative who spent three years living in Barcelona, thank the city for his great time there. Attaching theater tickets to balloons, he released them over the city hoping that they would find their way to random people. The video has now been watched over 350,000 times. Launched in August 2010, Vitamin drink Emergen-C‘s “Share the Good” campaign is a Facebook app that encourages users to surprise their Facebook friends who need a pick-me-up. Using the app, users “tag” a friend who’s having a bad day, and Emergen-C will mail that person a free sample packet. How Good Grows is a site from Yahoo! that allows users to post their good deeds online. Status messages can then be shared across Facebook, Twitter and Yahoo! for friends and family to see. In September 2010, Kleenex launched their “Softness worth sharing” campaign. Participants could send a free packet of tissues, send friends a virtual Kleenex on Facebook, or design and print a custom label to stick on a box of tissues. One million packages were sent during the promotion. This is one of those consumer trends that doesn’t demand a wholesale strategic shift, or long and expensive discussion, but simply the right attitude. For ‘human’ brands, the ever increasing volume of publicly accessible information and the ability for consumers to share their experiences far and wide, create an environment in which a serious (and sincere) R.A.K. strategy may mean a brand is no longer being seen as inflexible and unwieldy, but as more compassionate and charismatic instead. Something which is, of course, priceless and actually enjoyable. For customers and employees. So learn from the above theory and the brands who are already applying, and then turn RANDOM ACTS OF KINDNESS into an effective, permanent part of your strategy! Watch “A Day Made of Glass” and take a look at Corning’s vision for the future with specialty glass at the heart of it. 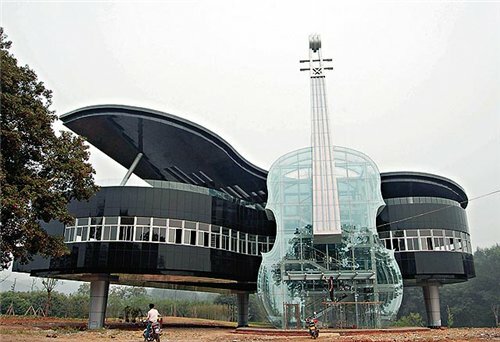 This unique piano house is in Anhui Province, China. This building was designed by the local Chinese government to attract more development to this area. Inside of the transparent violin is the escalator to the building, where a variety of city plans and ideas for the future development are on display. Great presentation on slideshare by Michael Altendorf. How the internet changes our lifes. You even might think it’s scary hahahaha. Imagine…. your identity will be in almost every-THINGs. But the funniest thing is, it is happening. We do stuff location based. It’s worth to watch this presentation.